San Luis, AZ – The Arizona Governor’s Office of Highway Safety awarded the San Luis Police Department (SLPD) $32,000.00 in grants for fiscal year 2019. This grant will allow the department to enhance DUI Alcohol Enforcement and Selective Traffic Enforcement. 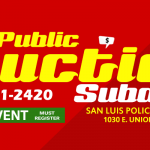 The SLPD obtained $17,000 to enhance our DUI Alcohol Enforcement effort throughout the City of San Luis. The personnel services and materials and supplies awarded through this grant will allow patrol officers to focus on impaired drivers during busy holiday seasons and try to make the roadways as safe as possible. In addition, the SLPD also obtained funds in the amount of $15,000 to focus on Selective Traffic Enforcement. The personnel services awarded through this grant will allow officers to patrol the areas were speeding and aggressive driving has been reported. The San Luis Police Department, through the help of the Governor’s Office of Highway Safety, has been able to continue to reduce serious injuries and deaths by arresting impaired drivers and enforce traffic laws during the holidays and long weekends. This year’s award will allow the SLPD to increase its enforcement within our jurisdiction.